Created for the 2012 Inn to Inn Herb Tour, serve these savory breakfast eggs when basil and fresh cherry tomatoes are bountiful in your garden! In a blender, combine eggs, milk, sun-dried tomato spread, flour, salt, and the 2 tablespoons melted butter. Blend for about 5 seconds until smooth. Cover and refrigerate at least 1 hour. Heat a seasoned 6-7 inch non-stick crepe pan until hot. Coat the pan lightly with butter, add 2-3 tablespoons of batter, and rotate pan to coat the surface. Cook until almost dry on top, then loosen edges, flip crepe over, and cook until lightly browned. Repeat process until all batter is used (yields about 12-15 crepes). Stack crepes on a plate separated by layers of wax or parchment paper. (To serve later, wrap in plastic wrap and refrigerate up to 3 days). Whisk eggs with milk or water and pepper. Cut tomatoes into quarters and chiffonade the basil. Heat a 6-7 inch nonstick saute pan and warm one crepe in the pan. Remove crepe to a warm plate and then coat saute pan lightly with butter or olive oil. Toss in cherry tomatoes and saute for a minute until they start to soften. Add beaten eggs and scramble over gentle heat. 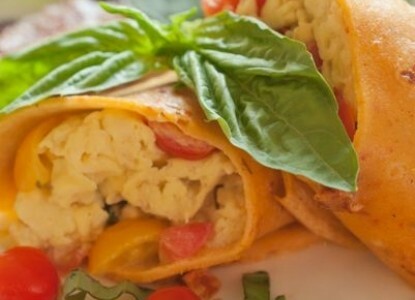 When eggs are partially cooked, add cheese and 2/3of the basil and continue to scramble to desired firmness. Spoon eggs onto one third of the crepe, roll, and garnish with remaining chiffonade of basil.